Hosted by Kulturpark 3000 e.V. , representatives from SWM, Fair Tunes, Archway Studios and Non Grata dropped in. The main idea behind this meeting was that all the partners collect ideas and materials together for the upcoming Grundtvig D.I.Y. manifestation in Tartu, Estonia at the "Liquidation of Art Academies" festival. At the same time a chance for Czentrifuga to collect more ideas and impressions about the other partners organisations and how to best combine the essential elements in our collaborative ongoing screenprint D.I.Y. manual "Cosmic Hospital"
In this sense, the bare white walls of the Premarts Gallery in Kreuzberg were a perfect backdrop for us to hang prints or video project information representing the different partners as well as a backdrop and an opportunity for brainstorming together with the visiting partners and the people visiting the gallery exhibition. Gabba instigatated an ongoing sketch making "Skizzos" workshop which is a good and easy way to get people involved by simply placing a few pencils and paper to hand and then to see how the resulting spontaneous collective ideas are cut and pasted together , transformed and amalgamated as physical product through the magic of screen printing! Al from Non Grata introduced us to an Estonian connection who specialises in PDF to book production. Now, some few months after the meeting, you can see some great results by Beat and Damien from Czentrifuga. 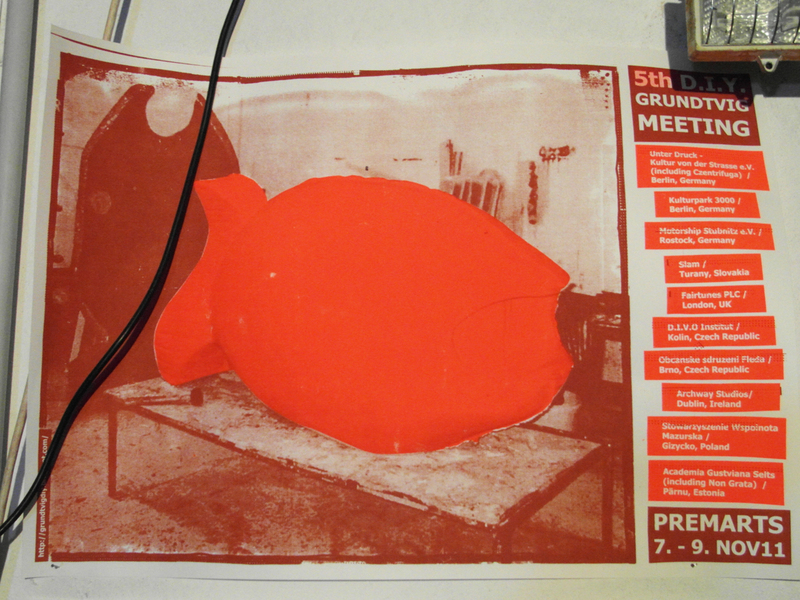 Heres a link to some of the posters and manual pages in progress from the ever expanding Grundtvig Art catalogue!